I just got back from visiting my family. This was my first trip back since my step mom’s breast cancer diagnosis and the thing that struck me immediately, was the strength I saw in her eyes. She spent most of the weekend visiting with all of the family, head unadorned by hair, scarf, or wig. I thought I would feel uncomfortable at her new loss, but instead I felt her strength and was comforted by it. She is bravely facing this battle and confidently making plans for ‘after treatment’. 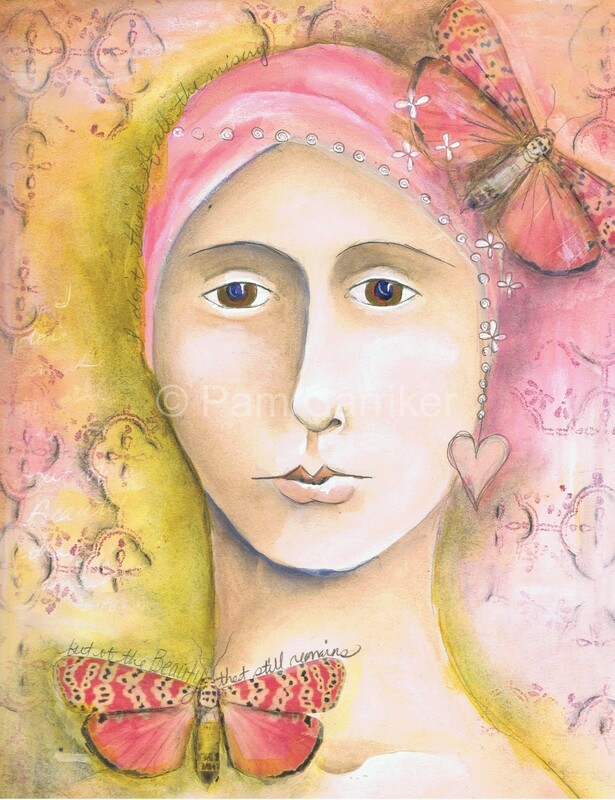 This piece titled Beauty in Strength is inspired by her and in an effort to continue raising funds for research efforts, I will be offering prints in my etsy Print Shop, with the profits going to the Susan G. Komen Center. I love it Pam, I got it today and this weekend I will shop for the perfect frame. As always, much love, prayers and best wishes for your step mom. Pam, this is gorgeous and the meaning behind it is beautiful. Do you mind if I blog about you and link to your blog? I just love your work. I am going to buy a print as soon as our finances allow. I just don't know how to choose! What a beautiful portrait.All the best to your step-mom. Pam what a lovely post and living tribute to your Mum! thanks for sharing this with us. I am so sorry to hear about your mother. It is hard to find words to comment. Somehow, "I love this piece" isn't enough. May your step mother continue to be strong. May you continue to create your phenomenal, moving art. oh my gosh pam…i got all choked up when i saw your artwork and read your posting. god bless your family. I always love your work but this may be my very favorite. What a wonderful way to help not only your step mother but so many others. My mother was a breast cancer survivor and I will definately be buying this print when it's ready. Way to go Pam! Beautiful stunning images..so glad I found you..
this painting is beautiful and inspirational. sending thoughts of comfort and healing for your stepmom. That determination in your step mother's eyes will carry her through this. I'm a cancer survivor, and I remember the day I found out. It sucked my breath from my body for several hours, then that determination, and the acceptance of what hand I'd been dealt took over. I've never looked back, and I'm here 7 years later. And still determined. This is an incredibly moving piece, Pam. Thank you.. and hugs and prayers and cheering for your stepmom! This is a beautiful painting—just so beautiful. Really awesome painting. I love the calm look she has. I will pray for your step-mother's recovery. It is a beautiful special piece Pam, congrats on an exceptional piece! Blessings on you for doing this, and also to your step mom. May her physical healing be complete. I literally have tears in my eyes as I am leaving you this comment.I had an aunt who passed from breast cancer and she had that same wonderful strength in her eyes when she was fighting her disease.I also love the colors so much .Before my aunt died I dreamt of this most beautiful butterfly accending into the heavens,I cannot even describe it in words it was so beautiful .I have a tattoo on my shoulder to signify her death, it is a butterfly with a breast cancer ribbon for its body.I did the butterfly because of the dream and one day a lady told me that a butterfly was the symbol for hospice.I am so touched by your painting. Pam, you have outdone yourself on this one. Such depth and strength and yes, beauty comes through. I think you should present this to 'someone that is someone' in one of the breast cancer battle societies. This could become the poster they use in all their promotional work. Its absolutely wonderful and eye catching.